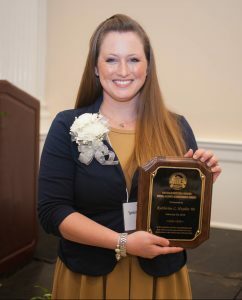 During the University of Montevallo’s annual homecoming luncheon, UM’s chapter of the National Alumni Association recognizes one alumnus under the age of 35 whose early career and community achievements have reflected positively at the local, state or national level. Dr. Kate Hayden of Calera is this year’s recipient of the 2018 Nathalie Molton Gibbons Young Alumni Achievement Award. Hayden graduated from UM with a bachelor’s degree in chemistry and biology in 2006. As an undergraduate, she completed and presented research under the mentorship of Dr. Cynthia Tidwell, professor of chemistry. Hayden also studied the Ebenezer Swamp Ecological Preserve with Dr. Mike Hardig, professor of biology, resulting in another research presentation. These practical experiences, combined with UM’s dynamic liberal arts education in the classroom, inspired Hayden to pursue a career in scientific research. After graduating from UM, Hayden worked as an analytical chemist for Avanti Polar Lipids Inc. in Alabaster. In 2009, she enrolled at UAB to continue her education in biophysical chemistry. In order to fulfill her degree requirements, Hayden worked as an undergraduate lab instructor. She discovered a new passion for teaching while observing how her students would process, learn and then apply lessons in their lab work. In addition, her dissertation work included collaborative projects with colleagues at the UAB Comprehensive Cancer Center. The promising results of these projects inspired Hayden and her associates to co-found the biotech startup Blondin Bioscience. Hayden spent four years at Blondin as director of research, working with fellow scientists to develop improved diagnostics to better treat cancer patients. In 2014, Hayden earned her doctorate in biophysical chemistry and accepted a position at Birmingham Southern College as an assistant professor of chemistry in 2015. There, she continues to mentor college students on research and internship opportunities while also teaching biochemistry, advanced biochemistry and medicinal chemistry. Hayden’s keen scientific abilities were recognized in 2016 when she was honored as a Rising Star in Healthcare by the Birmingham Business Journal and an Innovator Changing the South by Southern Living magazine. Last August, Hayden’s prowess in the classroom earned her the Bob Whetstone Faculty Development Award for excellence in teaching at BSC. When she’s not innovating in the lab or brightening minds in the classroom, Hayden is at home in Calera with her husband, Patrick, and son, Wesley.